Day two of our garden opening is always a more relaxed affair and I am thoroughly looking forward to it. On day one the rain absented itself, but the wind did not. At times yesterday it gusted so hard that I got lost in a blizzard of white begonia flowers cascading from the shelves of our outdoor kitchen. Along with the begonias, many plants did not enjoy the thrashing, but all will bounce back, some already producing fresh flowers this morning. Garden lovers are hardy folk and it seems few were perturbed by the bracing conditions. We welcomed almost 100 visitors in our first four hours, many of whom were returning for the second or third time. It’s so enjoyable to stand in my little corner of the garden pointing out plants and chatting about the garden: everyone wants to talk, which suits me well. The stars of the show, and there are always a few, were the red-barked Santa Cruz Ironwood tree (Lyonothamnus floribundus ssp. aspleniifolius), a Californian evergreen accustomed to exposed conditions, and Aeonium ‘Zwartkop’, which has formed particularly tall, black rosettes this summer. In a forthcoming post I will list sources for some of our most popular plants for those who are interested to try them out. That sort of reaction makes all the effort worthwhile. The Watch House, 7 Thanet Road, Broadstairs, is open today, Sunday 21st August 2016, from 12-4 with fine teas served at 3, Polegate Cottage. Your garden looks wonderful, thank you for the short film yesterday which was a little consolation given that I do not live close enough to visit in the flesh. Dear Dan, so pleased that you did not get the rain (we did!) 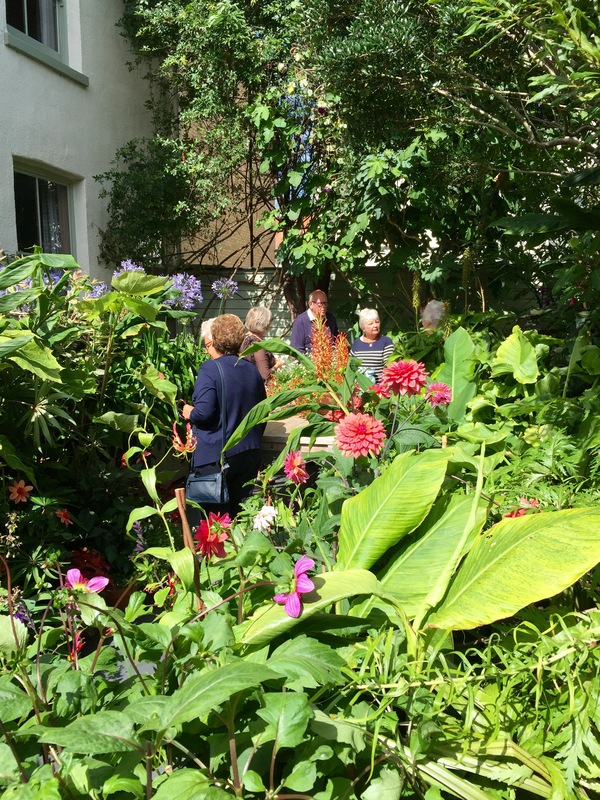 but lots of visitors, ‘exhilarating garden’ just sums it up. If you are open next year Mr TT will definitely be persuaded that a holiday near Broadstairs in August is on my Bucket List. Good luck with today’s opening. If you do decide to come down this way let me know so I can recommend a few places to stay and / or visit. We would love to see you. Meanwhile still negotiating with HI about opening next year. Normally best to let him recover a little bit before broaching the subject! Blowing of well-deserved trumpets is essential to drum up support, plus it’s one of the perks of opening your garden on behalf of a good cause. 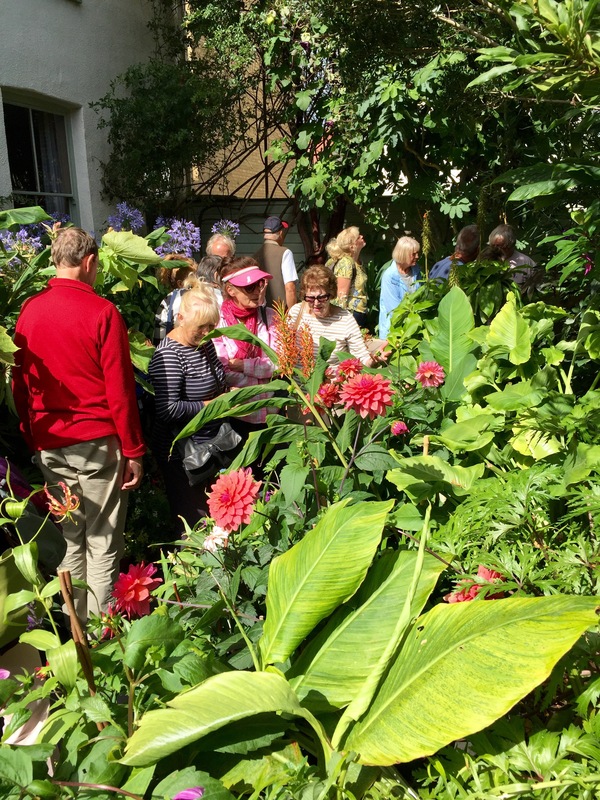 Also, it’s fascinating to hear what critically minded visitors have to say; as a garden owner, the receiving of them is another perk of the job. Well done, hope you have a such a good day that you almost run of lemon drizzle cake😉. Great work! Enjoy the warm afterglow of your success. A lot of the plants certainly were bigger than our visitors. And I have just noticed that our cobaea is producing fruits, which is exciting. We are both shattered but very happy with the turn out. Enjoying a well earned bottle of rosé. Thanks Judy. Alex and I feel like we’ve run a marathon this weekend. And tomorrow Martha arrives, so we need our wits about us! I fear your vision may be entirely correct Judy. We shall find out in precisely 6 hours! !